(by single surgeon) from June 2006 to march 2009. Of these, 15 patients underwent MIE after neo adjuvant chemotherapy. These 15 patients were given neoadjuvant chemotherapy in view of locally advanced disease (Detected by Imaging or diagnostic thoracoscopy/ laparoscopy) and were considered operable after repeat imaging. Outcome parameters with respect to technical feasibility and postoperative outcome of those who received NACT and those who did not, were compared. Results: There was no conversion to open surgery in both the groups. Blood loss in Neoadjuvant group (NACT) was 175ml compared to150 ml in other group (not significant). Mean operative time in both the group was not significantly different (4.1hours Vs 3.5 hours). The mean ICU stay (4 days vs 3 days) and the pulmonary complications (3/15 vs 4/52) were significantly more in the NACT. Mean hospital stay was higher in the NACT group (8 vs 7) but the difference was not significant. 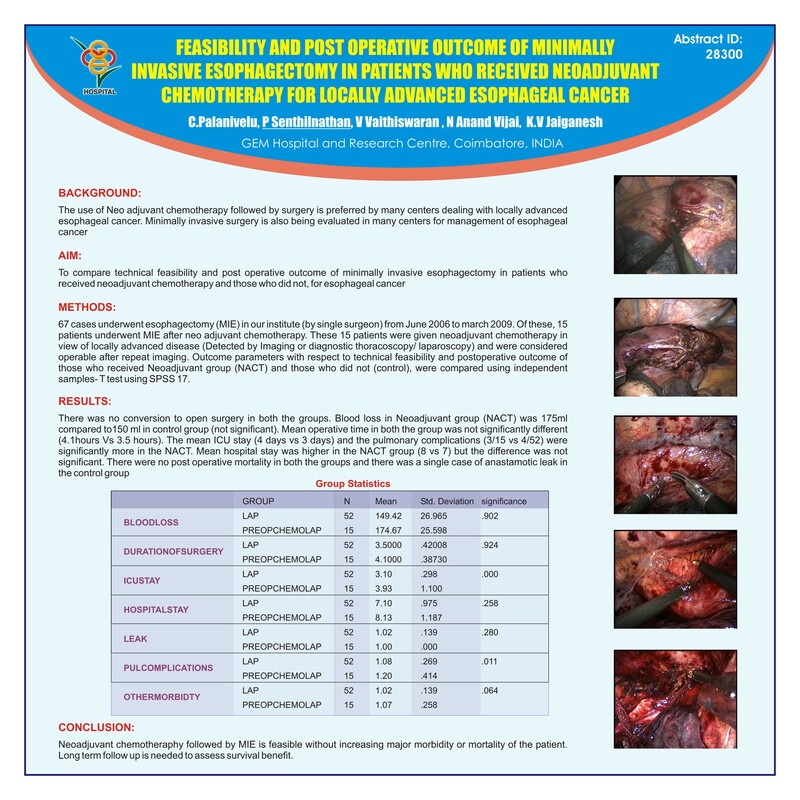 There were no post operative mortality in both the groups and there was a single case of anastamotic leak in the group that did not receive neo adjuvant therapy. Conclusion: Neoadjuvant chemotheraphy followed by MIE is feasible without increasing major morbidity or mortality of the patient. Long term follow up is needed to assess survival benefit.